The MaxLight X Series Pre-Inked Notary Stamps have a new sophisticated look but are still guaranteed to be some of the best types of pre-inked stamps you can own. The high-end MaxLight X Series stamps have dual springs which allow for the perfect impressions every time they are used. MaxLight X Series stamps are made from a very eco-friendly process with very low emissions. Your MaxLight X series stamp is sure to turn heads at the office! Unsure if the MaxLight X Series are the correct products for you? Contact us! 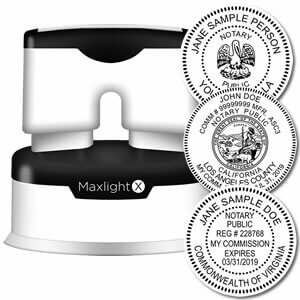 The Premium MaxLight X Official Round Notary Stamp is a great product for all notaries. Dual springs allow for the perfect impression of your notary seal every time. 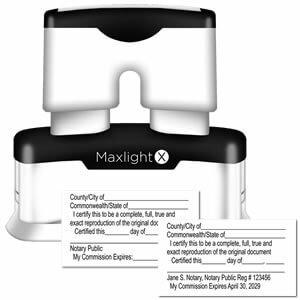 All MaxLight X Official Round Notary Stamps are made in an eco-friendly process and are guaranteed to be in accordance with all state specifications. With over 50 years of experience, Notary Supplies Online is guaranteed to provide you with stamps that will work best for the type of work you do. This Premium MaxLight X Official Rectangular Notary Stamp was designed with the busy notary in mind. We know that with lengthy documents it is not always easy to find an area to stamp your seal on. Our Premium MaxLight X Official Rectangular Notary Stamp was designed so you can fit your seal in almost any margin of your document. Supplemental stamps can make a notary public's job much easier. 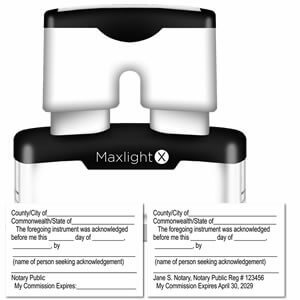 Our Premium MaxLight X Notary Acknowledgment stamp was created to make your notarial act efficient and organized. If you are acknowledging a document, it means you are confirming the identity of the person who has pre-signed the document. Simply press the Premium MaxLight Notary Acknowledgement stamp to the paper and receive a perfect impression and space to provide key details required to be on the documents. Jurat notarizations are an important part of being a notary public. Use our Premium MaxLight X Notary Jurat Stamp to record any oath given while witnessing the signing of a document. With precision stamping guaranteed every time, you will not only look, but also feel, professional and your clients will be impressed. In many cases, a notary public may receive a request to certify a copy of a notarized documents. Certifying a copied document comes with a lot of responsibility. 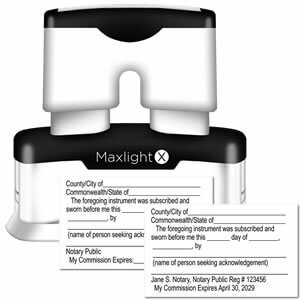 Use our Premium MaxLight X Notary Certified Copy Stamp to assure your client, as well as your self, that the required information that should be added by a notary public is printed on your document. It is important to check with your state board about the types of documents you may certify as a notary public in your state.